Where can we place this isaignani illayaraja something much more than vidwan and vidushi but let me take him as vaggeyakkara as after sadguru Thyagaraja , dikshitar and there is illayaraja. I feel like writing all that i know for pages and pages as I have followed, talked and discussed right from as early as my age 7 to 10 when I just knew about him(that is early 80's) to slow and steady accumulation of missed and refreshed past thru YouTube. Of course there are million like me who can do the same. See the love for music and he paying obesiance to navarathri,particularly he advising the one and only super star prodigy mandolin srinivas in 1980 , just read this lovely writeup of him in The Hindu dated Oct 18th,2018. Being navarathri and saraswati pooja today let us just start with one of his 8000 to 10000 wonders appropriate for Devi . Rajesh, I have sent you some of the photos of the concert held in Ilayarajas' house through whatsapp. Pl see. Where can we place this isaignani illayaraja something much more than vidwan and vidushi but let me take him as vaggeyakkara as after sadguru Thyagaraja , dikshitar and there is illayaraja. I am going to let that pass, but when you look at the definition of the word vAggEyakAra - it means someone who wrote the lyrics and set them to music themselves. Has Sri Ilayaraja done that? I know he has set lyrics to immortal tunes, but has he written the lyrics and set them to music? 1. In early days for the first 5 to 7 years 1976 to 1982 timeframe quite a few numbers were written by him and reused for films for many years later. 2. Post 2000 many movies he was a lyricist , but the truth of the matter his tunes were not that catchy as in 76 to 94. 4. On a devotional album by name gitanjali he wrote a lovely song kamakshi karunavilasini,atleast this number has the possibility of he writing lyrics first and then tuning later exactly answering your query as an investigative journalist if you ever get the kicking drift. 5.By the way the so called pureplay vaggeyakkaras like GKB,Papanasam Sivan, Trinities(T SS and MD)etc did not have to worry about musical interludes. Only two dimensions lyrics and melody possibly with ofcourse bhakthi. But Illayaraja had to worry atleast few more dimensions like orchestration , interludes ,humming , visual situation. 6.When I talked with Madurai Gold Standard Mani (Madurai GS mani) in our rasikas meet at nageswaran house when TRS maama was there, he was mentioning chumma illa pA music director unlike vaggeyakkaras he said just imagine KV mahadevan, illayaraja from just words in a paper, he even gave an example of a song from that first set of words they create music. Another samayal song from Unnal Mudiyum thampi. Music Ilayaraja. many common usages between both the songs- iin lyrics and ragams too- Kalyani, Vasantha . Both hilarious songs. Last edited by CRama on 20 Oct 2018, 16:22, edited 1 time in total. Kamakshi karuna vilasini- Thanks for giving the link. Never knew about this song. Good. However, I will rate Ilayaraja the singer much below Ilayaraja- the composer - remembering a few songs that he has sung in films that I have heard. Rajesh, Surprised with your usage of GOLD STANDARD for Madurai G.S.Mani. 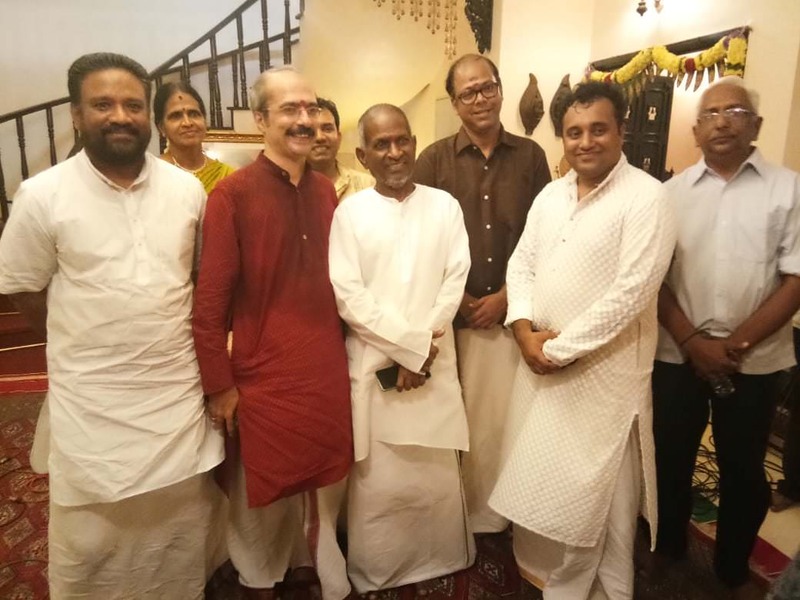 Is there a photograph that you took with illayaraja sir. hope you are not modest in not passing that to me. Illayaraja the singer is indeed not as great as singers SPB(another God of Music for me) or KJY. On kAmakshi karuna vilasini raga check ganeshkant and narayanan , that guy narayanan was once active in creating crossword then went out of forum , illaryaraja is a perennial creator. He was at minimum excellent or at maximum outstanding. In general if you have time just go into youtube search Madhura Sudha (ID) whose name is Tesla Ganesh. He is extraordinary in taking ragas ,backgrounds of illayaraja songs, thamizh marabu isai influence of raja sir, he keeps it with a dash of carnatic aarohana and avarohana raga explanation and then goes into different songs . Tesla ganesh also hears carnatic music , i dont know him yet but one friend of mine outside of forum knows him a lot and I think our lalitharam knows him too. This person Tesla Ganesh has segmented each raga like keeravani, Suddhadhanyasi and atleast 20 + ragas here. See his contribution on his extraordinary contextual explanation without getting carried away to the next topic. To start with Illayaraja and keeravani are inseperable . rajesh, I never took a photo with Ilayaraja. There was a big rush for photos and I did notpush myself. IN fact the group photo of Ilayaraja with all artistes and Sivaramakrishnan is taken by me. Has Sri Ilayaraja done that? I know he has set lyrics to immortal tunes, but has he written the lyrics and set them to music? It just stuck me just today that illayaraja has written lovely lyrics and also composed a great song from the film idhayakovil. The song Idhayam oru kovil has two versions , one sung by illayraja and another by SPB, i love the later. See in this song there is a line where illayaraja has written the absolute truth, if I was musician i will take this line and sing as a neraval. Personally having spent in the land of Tamilnadu knowing lot of tamil songs of illayaraja and few very popular telugu overlaps like sagarasangamam,about 2 or 3 years back i and few of my US friends are exchanging few private chats of illayaraja in songs other than thamizh. One of my friend was talking about sopanasangeetham and the other was just talking about ashtapadi after they read my recent writeup of vidushi vasundhara concert. One very knowledgable friend who is outside India just casually asked me if I have heard the song aalOlam peelikavadi in the malayalam film aalOlam that got released in 1982. He said the tune is sopanasangeetham and that knowledable friend connected to ashtapadi. O gosh then hunted to hear this lovely tune of raja sir . KJ yesudas sings this song with kavalam sreekumar singing the ashtapadi , the tune is in the evening breeze raga malayamArutham and incidentally raja sir ends with the ashtapadi priyE chArusheelE in mukhari. I also searched youtube and just found out the song , it is a title song of the movie , Damn it how many great tunes of illayaraja gets wasted as title song , that way it never found a way to doordarshan tv. Raja sir was in phenomenal form in 1982, I was hearing and seeing the thamizh movie payanangal mudivathalai then with no awareness of this song.Now after how many years 36 years I just got to know aalOlam.